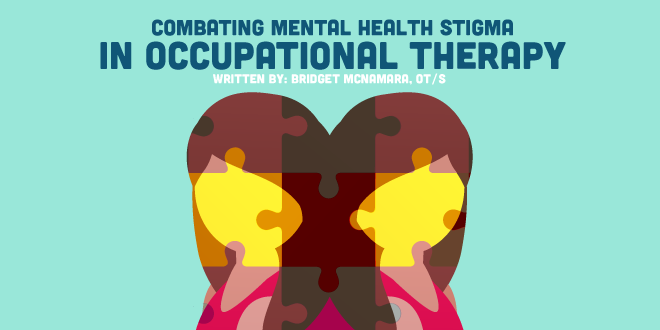 As occupational therapists, we have a distinct ability to combat mental health stigma and reduce barriers to accessing mental health services for our clients across all settings. Underutilization of mental health services can have a huge impact on function, wellness, and ability to participate successfully in everyday life. 50% to 80% of people experiencing mental illness do not access mental health services, one of the main reasons being mental health stigma. Stigma exists on different levels, from inaccurate portrayals in the media (think violent criminals or poor victims) to self-imposed stigma, associated with shame and guilt when asking for help. People don't want to be labeled as “crazy,” or “unstable,” and are often scared of how it will impact their careers and relationships if others find out. As occupational therapists, we know the simple act of doing can make a huge impact! How often do you use the words such as crazy, insane, nuts, etc. without even thinking about it? It may not seem like a big deal, but the flippant use of these types of words could cause a client to become defensive or lose trust in you. It also has potential to affect a person on a subconscious level, contributing to shame and self-stigma, leading to avoiding treatment. Being aware of your word choice is a small step that can make a big difference for your clients. It can be very easy to feel resentment toward someone who has engaged in negative behaviors and is now suffering the consequences, but it is incredibly difficult to help someone with that mindset. Using some meditation, positive self-talk, and reframing can be incredibly beneficial for you as the clinician. Realizing your bias and addressing it can really help build positive rapport and therapeutic relationships with your clients! Interaction with people in various stages of mental health will help you to connect to different people, distance yourself from stereotyping, and be able to see people as more than their diagnosis, whatever it may be. We tend to fear the unfamiliar. If you have not worked with people with mental illness, I highly recommend making the time to do so. People from all walks of life with all types of backgrounds and all types of reasons experience mental health challenges. Normalizing the process for yourself will help you work towards normalizing the process for others, and in turn, reduce buy in to mental health stigma and discrimination. Realize that the media's portrayal of mental illness can be romanticized or exaggerated, and is made to entertain. Help other people realize it. When someone else says things or does things that perpetuate mental health stigma, let them know what they are doing (in a respectful way of course). Don’t be afraid to start that conversation and open that dialogue. Someone who has experienced some type of mental illness is likely within earshot. Hearing you stand up for them can increase their likelihood of seeking help and increase their feeling of self-worth. Be knowledgeable about resources and services available in your area, and be sure to connect your clients to what they need. These steps are things you can implement TODAY, and join the fight against mental health stigma. Please leave comments on other ways that you combat mental health stigma in everyday practice!